The Tipi is the nomadic housing par excellence. Its conical shape effectively leads the fire smoke out by a narrow opening at the top of the cone, a protected smoke outlet with two "ears". These ears allow the correct outlet of smoke even on days of heavy rain. This is adjustable. Inside, a strip of canvas from 1.5 to 2 mts. insulates from the cold, humidity, insects and small animals, ensures a pleasant temperature and provides privacy. It cuts out the shadow effect created by the inner fire - outer cover. 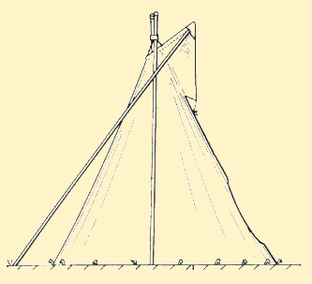 The tipi forms a tilted cone. The short side of the cone is tilted back to provide protection against the wind and allow a greater right foot tipi in this area. More for practical reasons than spiritual tipis were mounted facing east as the winds on the plains come predominantly from the west. The fireplace is slightly off the center, closer to the door - creating additional space at the back of the tipi. This means that the opening for outgoing fire smoke as well as tobacco smoke control flaps will be directly on the hearth ensuring the correct output smoke typical. 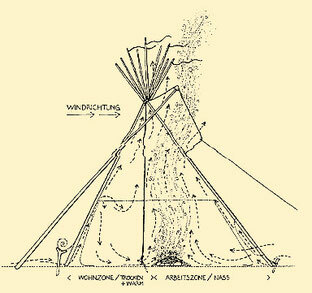 Compared to other portable tents, the conical shape and the smoke control flaps make the Indian tipi unique. These flaps can be adjusted for protection from wind and rain. While one smoke outlet cover to maintain the hot, dry tent while allowing the smoke carry out the "chimney". During the cold season the inner lining provides insulation and ensures a comfortable temperature. The lining of the bottom seals the interior of the tipi against humidity, rain and small animals or insects. This ensures a comfortable environment.